Rayavadee is an ideal destination for couples and those wanting to explore everything Thailand’s beautiful Krabi has to offer. It’s set on a glorious white sandy beach where you’ll find crystal clear waters and plenty of water sports, as well as opportunities to simply relax and soak up the sun. Set out in the style of a Thai village, it’s surrounded by the spectacular limestone cliffs the area is so well known for, as well as luscious rainforests, with Krabi Marine National Park at its edge. Choose from relaxing spa treatments, a range of classes and excursions and some exquisite menus at the onsite restaurants in this ‘Leading Hotel of the World. Choose from delicious snacks and light bites as you overlook the beach at the Grotto. Dishes include fresh salads and healthy stir fries. Offering a selection of international dishes, guests can enjoy Thai creations, pan Asian options, as well as American and European cuisine. Set in a beautifully decorated Asian setting and overlooking the beach, this is the ideal place to enjoy authentic Thai cuisine. 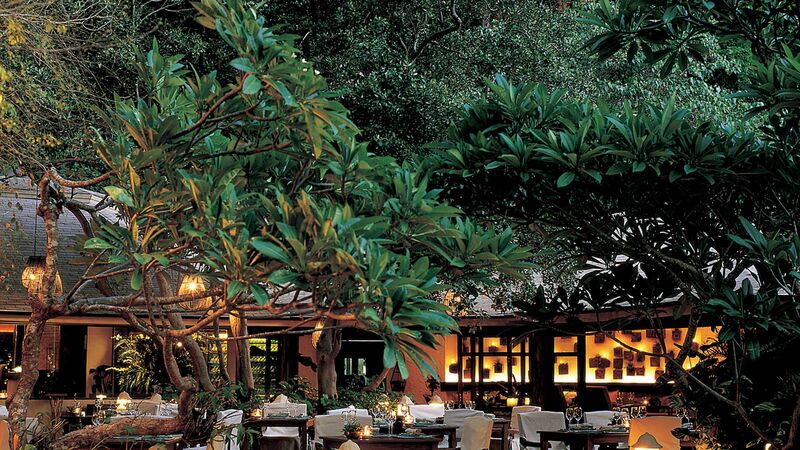 Choose from a menu featuring pan-Asian dishes and some international options as you take in views of Railay Beach. Take in the views of the hotel’s luscious surroundings and sparkling beach from the infinity pool. It’s perfect for long lazy days, with sun loungers and terraces to enjoy. 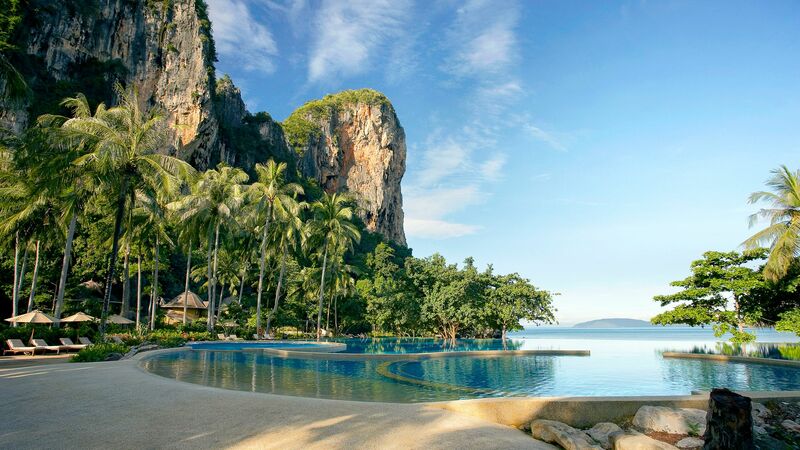 Rayavadee is located on the white sands of Railay Beach, where you’ll find crystal clear waters perfect for swimming and loungers ideal for soaking up the sun. Children can spend their days keeping active and being entertained by the expert hotel staff, who put on a range of interactive experience. 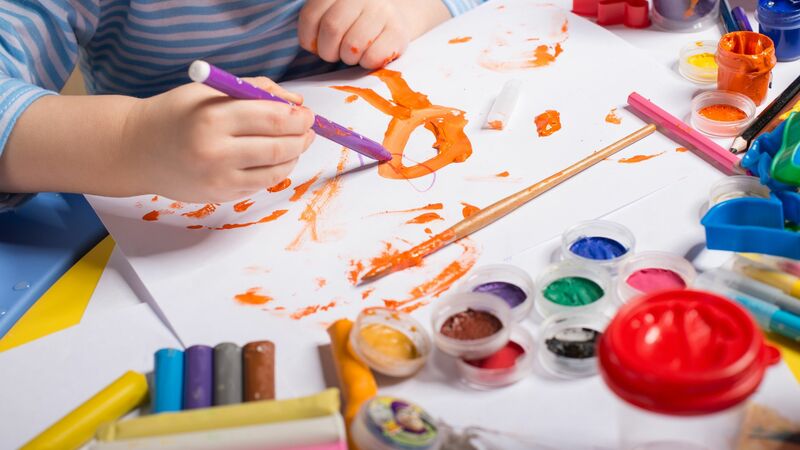 Activities include cooking, arts and crafts and a discovery walk where they can see the creatures that call the garden home. 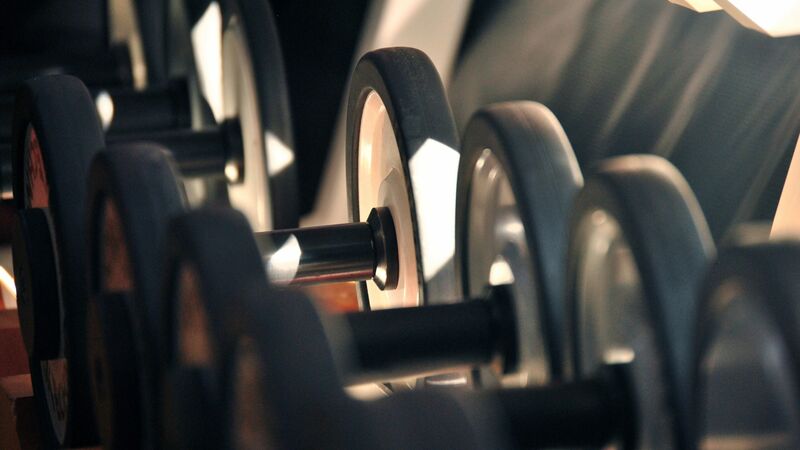 Keep up your fitness regime while on holiday at the Rayavadee, where you’ll find a fully equipped fitness centre replete with cardio and strength machines. Immerse yourself in a world of tranquillity at the Rayavadee Spa. 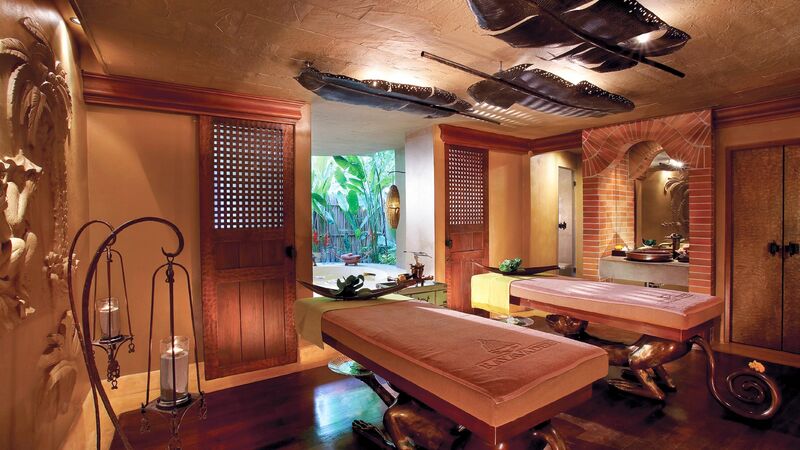 Using ancient Thai traditions and treatments, try facials or massages and leave feeling fully rejuvenated. Active guests will enjoy playing squash or tennis on the hotel’s courts, with equipment available to hire from the hotel. Learn to carve beautiful table centrepieces from fruit, make flower garlands or create works of art at the hotel’s classes. Or, you can explore Krabi with the hotel’s range of excursions, which will take you rock climbing, hiking or to see sights of cultural significance. Choose from a range of water sports during your stay, including snorkelling, canoeing and wind surfing. 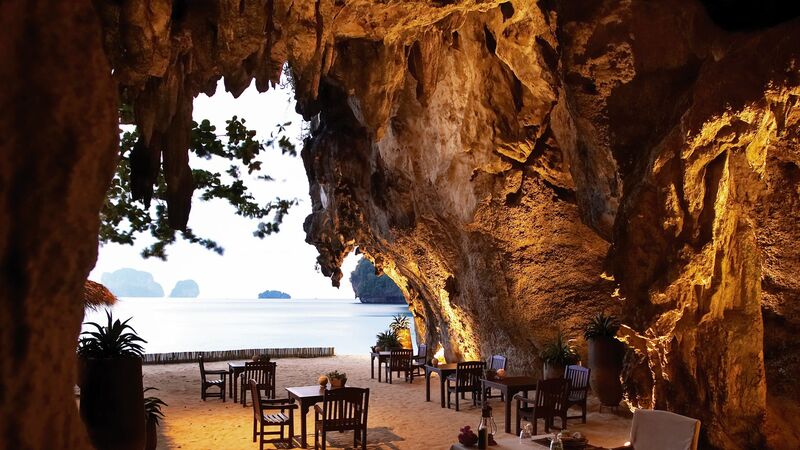 Rayavadee is located along Thailand’s Krabi coastline, which is well known for its spectacular natural attractions, including white sandy beaches and towering limestone cliffs. Head into nearby Krabi Town and spend an hour or two perusing the market stalls, practicing your haggling skills, before enjoying a delicious Thai menu at one of the many restaurants. Spend long lazy days relaxing on the beach, or take to the waters with water sports and excursions. Boat trips to the nearby Phi Phi Don or Phi Phi Leh islands allow you to see a quieter side to the country. 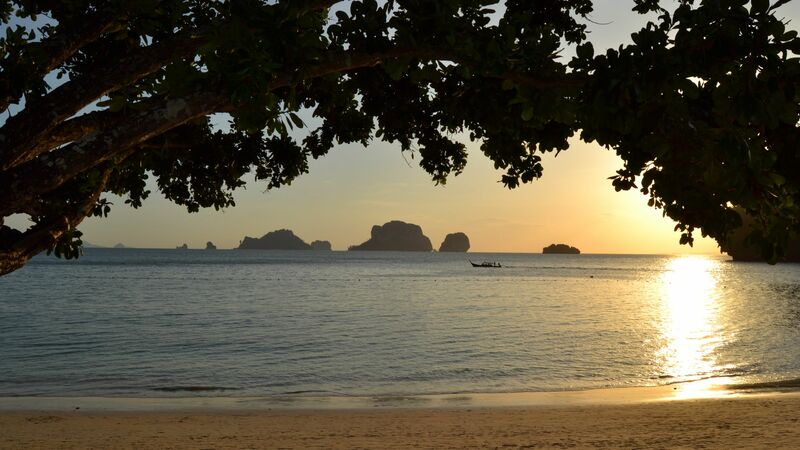 Rayavadee is 40 minutes from Krabi Airport. 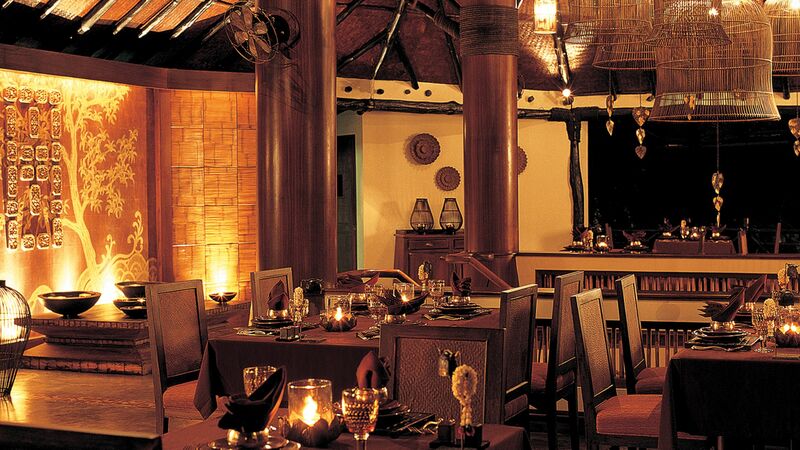 Deluxe Pavilions are decorated with dark wooden furnishings with handcrafted detail. 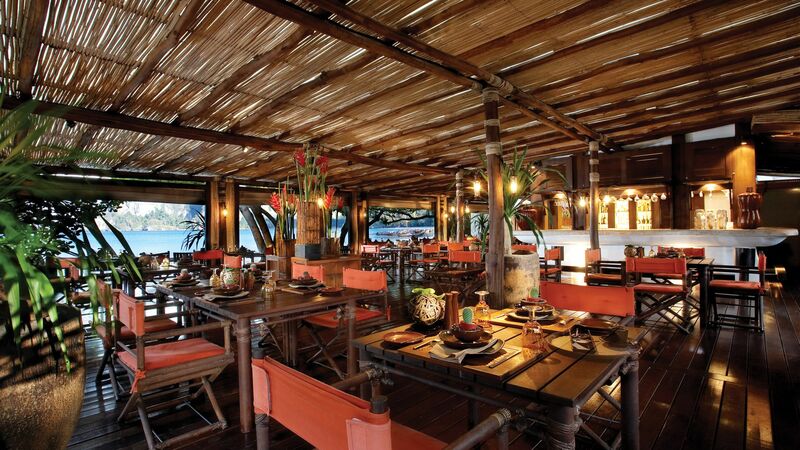 The two-story pavilions are equipped with a private terrace and seating area with views of the natural surroundings. Spa Pavilions offer all of the same features of the Deluxe Pavilion as well as an outdoor Jacuzzi® with sun loungers. Terrace Pavilions offer a contemporary take on the Deluxe Pavilion. They feature an outdoor terrace with lounge area surrounded by lush gardens. The terrace area can also host barbecue dinners. Stay 4 nights and pay for 3 nights, stay 7 nights and pay for 5 nights stay 10 nights and pay for 7 nights and stay 14 nights and pay for 10 nights for holidays between 03 April - 19 December 2018, 11 January - 01 February 2019 and 11 January - 31 March 2019 when staying in a Terrace Pavilion. Please call our trusted adviser for further details. Honeymooners receive a welcome drink on arrival, a selection of tropical fruits, flowers, a bottle of Champagne and one 75 minute massage for two at the Rayavadee Spa for holidays between 11 January - 19 December 2018 and 11 January - 31 March 2019 (you must stay at least 3 nights to get this offer). This resort is one of the best I’ve been to! It’s on 3 beaches, amazing staff, beautiful nature, great food! The boat trips are a must to the islands, ask to go to islands with less tourists.. The perfect vacation. Thank you Rayavadee staff!! Having visited Railay Bay for over 20 years, Rayavadee was always a place I wanted to stay, and a few years ago was our first visit. A truly memorable one at that, and once was never enough hence our return visit to this incredible resort in paradise. Absolute peace and quiet, complete privacy in luxurious villas. The customer service is impeccable, world class in every possible conceivable way. The location, the views, the beaches, the jungle, the destination. The is by far the worlds best hotel resort, Definitely recommended. A positive remark first: the staff is very friendly and the rooms are clean and spacious. But that is where the positive aspects end... We chose this hotel, because we wanted to relax and chill out on a beautiful beach. We traveled 16 hours to get to Krabi (which is only reachable by boat, which made us mistakingly believe it must be tranquil, and here is what we found: The beach is beautiful, but is a major day excursion trip and as of 10am until 9pm is crowed with hundreds of tourists who are brought over mostly in very noisy, polluting long tail boats. The beach is so full of these parked boats that you think you are in a parking lot of a big supermarket. Many boats blast out some daft music and compete with each other on terms of who has the loudest speaker system. They come and go the whole day, so that there is constant noise which make you feel you are at Grand Central Station in New York. These hundreds of day-tourists need to go to the toilet, and yes - you guessed right - they try to sneak in to the hotel, and use the hotel's facility. There is some security, but they can only do so much. People will climb over the rocks and walk through the bar to use the toilets (or worse, do their business right at the beach or in the ocean...) The hotel said, they build public toilets for these day-guests, but they are not enough and moreover not visible as they are built to the side of the resort so most day-tourists never see them or know that they exist (there is no signage visible from the beach). There are bars and restaurants nearby, and they bang out the music until 4am EVERY NIGHT. We arrived on a Saturday, and first thought they had a wedding at the hotel, only to realize the music came from further away, and they party every night of the week until 4 in the morning. Forget about sleeping with open windows... The food at the restaurant is ok, but the atmosphere is from decades ago. The life band plays cover versions from the fifties and sixties like Burt Bacharach's "Raindrops keep falling on my head" from 1969 and the like... My grandmother would probably have enjoyed this type of music... Now you can argue that the noise of the nearby bars as well as the invasion of day tourists at the beach is beyond the hotel's control, and I might even agree with that to some point. But then why is the hotel publishing photos that show a vastly different environment and not even using small print to warn potential guest that there might be noise and massive hordes of day-tourists at the beach? (See photos). And above all that, how does the hotel justify its exorbitant price levels when it fails to provide the luxury of a nice beach with tranquility? We booked for 6 nights, but checked out after 3 and went to another luxury resort a short boat trip away, where we found what we were looking for in every aspect. We will definitely return to Thailand but surely not to the Rayavadee and certainly not at these prices. “ Amazing experience from the first moment to the end. This resort is absolutely beautiful and the service is top notch. I just went here for a few days on my honeymoon and we were very pleased. The prices, however, are a bit outrageous and deterred us from wanting to eat/drink at the resort when we realized how much cheaper things are right around the corner. That being said, it’s by far the nicest resort and the landscape is absolutely perfect! I would just suggest stocking the mini bar with some of your own snacks/alcohol and do some exploring on the “walking street”.